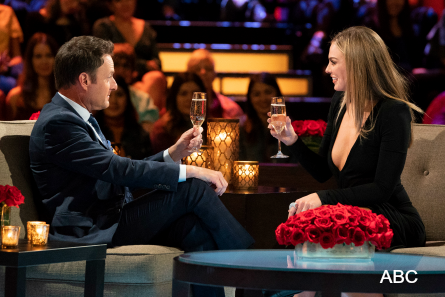 We were promised 22, but only got 19 of the 30 women from “The Bachelor” season 23 came to “The Women Tell All” taping to give their reccounts and their arguments and experiences on the most riviting season of “The Bachelor” to date. The women who attended “The Bachelor: The Women Tell All” were: Bri, Tahzjuan, Jane, Alex D, Nina, Angelique, Tracy, Katie, Caitlin, Catherine, Nicole, Sydney, Courtney, Heather, Onyeka, Hannah B., Kirpa, Demi, and Caelynn. A few of these women (Bri, Angelique, Alex D.), we didn’t hear a word from. Some of these women (Courtney, Nicole, Demi) we heard TOO much from! The last episode of “The Bachelor” left viewers with Colton scaling an 8 foot fence then disappearing into the night in the Portugal country side. 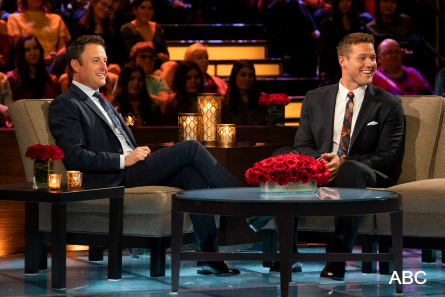 Host Chris Harrison called it “the craziest thing” he’s seen. He’s hosted the show since it’s inception, so that’s saying a lot. Heather and Sydney both reacted to Colton’s profession of love to Cassie in the way that the show may likely end this season. That is – it would be inapporpriate for Colton to proceed to keep pursuing Tayshia or Hannah G. after that whole scene with Cassie. 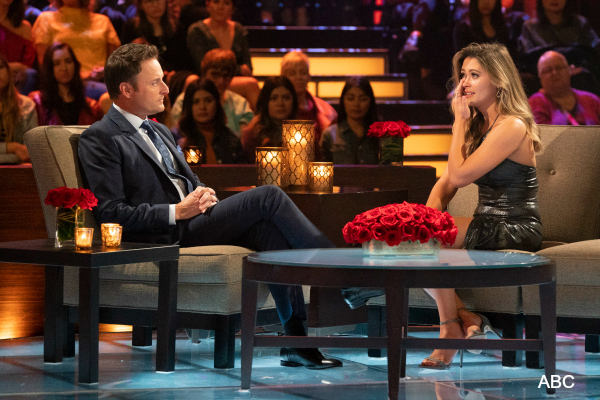 Footage of “The Bachelor” Colton Underwood being warned from a number of women, including – Katie, Kirpa, Tayshia, Demi. That was followed by footage of the very immature bickering between younger girls in the house – Demi, Nicole, Onyeka, and Courtney. Guess which one the show chose to expand on? That’s right! More fighting between the women that included Catherine’s stealing Colton four times for conversations in night one. The viewers of “The Women Tell All” were subjected to sititng through more verbal attacks on each other that we already got tons of from Demi vs. Courtney, and Onyeka vs. Nicole. After the show’s first commercial break, Harrison finally asked the important question addressed to Katie. Who was she warning Colton about upon her exit from the show? She cleared-up her ominous warning and stated that she was “mainly” talking about Caelynn and Cassie. Caelynn was annoyed that Katie didn’t name names to Colton which pretty much put him on guard with every relationship in the house. Katie said she “came to the conclusion” that some of the values of other women “weren’t matching” what Colton wanted. Katie answered another burning question which was about Caelynn and Cassie discussing being the next Bachelorette. Katie stated that this conversation between the two women happened during a busride from the airport in Singapore to the hotel. She said they used the word “winning.” He wasn’t to be “won” but “a relationship to be worked for,” said Katie. Caelynn gave her version of what Katie heard which was her and Cassie, her best friend, wishing each other to be the next Bachelorette if Colton didn’t choose them in order to find their person. Katie was incredibly upset at this point that Caelynn wasn’t being truthful. We also learned that Katie had phone conversations after the show with Caelynn. Katie said Caelynn is manipultive which is what Hannah B. warned Colton of. Harrison asked “what just happened?” Demi said she has to “block that out. Let’s talk about Demi!” That was followed by a montage of clips of Demi’s time on “The Bachelor.” Demi said it’s very hard for her to be vurnerable and she has a hard shell. Demi admitted on-stage to being “permiscuic” and confident. “I know who I am and I will continue to be that for the rest of my life” which she considers more mature than anything. She said in Vietnam she wanted to be married to Colton and was “1000% there for Colton.” She called it “unlike any other relationship she’s had.” Demi answered Harrison’s questions about her mom being in Federal prison which she got out of during Demi’s time on the show. Harrison hinted that Demi will most likely be going to “Bachelor in Paradise” when he said to Demi, “we’ll probably see you again somewhere!” Demi giggled. Harrison rolled clips of Nicole crying over everything. She said her family taugher he it’s okay to express herself. “It’s been hard. The Bachelor, it’s not an easy experience. I wanted to give it my all.” She teared-up talking about leaving her best-friend, her autistic twin brother to be on the show. Nicole also blame being Cuban as part of her being so emotional. Harrison said, “to help process your emotions, we have a huge surprise for you!” It was one year of free Halo ice cream. She was beyond happy and cried happy tears. Then Harrison, like Oprah, announced that “everybody get ice cream!” as everyone in the audience was handed a cup of Halo ice cream. Hannah B. had the first one-on-one date of the season. She reacted that the video clips of the time she spent with Colton on the show was hard to watch. To be that vunerable she said she has the pressure to be perfect coming from the pagent world and put-on what shehtought people wantd to see. So, she had to break that with Colton to be vunerable. She said she wants so much more and deserves so much more than staying in her town. “I’m a much different person and a better person. It allowed me to see what I want,” Hannah B. stated about being on “The Bachelor” show. In her last words in the ride home after Colton broke-up with her, Hannah stated that everyone deserves someone that will “love them fiercely.” Then, Harrsion gave Hannah B. a second chance to make a successful toast, something that she couldn’t do duiring her first date with Colton. Caelynn cried at the playback of her journey with Colton on the show – going through all the feelings again and seeing Colton say that he was falling in love with her. “Watching this back,” she said is reassurance that there was something there. She said that the women that had a connection, they thought that there was something there. Caelynn said she doesn’t understand how she could be just left standing at the end, and “nothing.” She said she’s shaking just thinking of Colton being there in person. 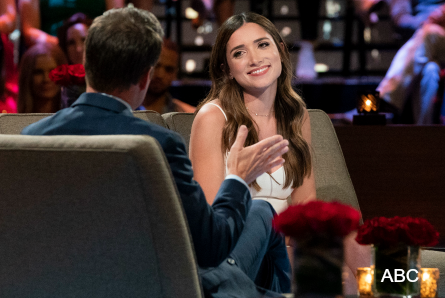 Harrison mentioned her very personal story that she revealed on the show and hoped that she felt the support of Bachelor Nation. Caelynn thanked everyone that reached-out. She said in the moment of telling Colton, that felt right, and she is still getting messages from others who have also experienced sexual assault. Demi told Colton that she appreciates his honesty and understands why she wasn’t the one for him. Then Demi got up to introduce Colton to Courtney, saying she’s never talked to him before. Then Courtney said nothing to Colton. Next, Harrison mentioned Caelynn wants some answers. Caelynn told Colton that her family asked what happened and she doesn’t know herself. Colton stated that, that Rose ceremony was the hardest one. He said the safety that they had together is something that he’ll value and apprecate. He admitted to not giving her closure and if there’s anything he can say, he will. She reacted it comes down to she loved him and he doesn’t love her. Sydney asked Colton if he’s still a virgin. Of course he dodged that question. Then asked her “what does whack my weeds really mean?” Harrison turned it around on the ladies and asked them to vote on how many think Colton is still a virgin. Only four or five of them raised their hands that they believe that he’s still a virgin. Colton said after he jumped over that fence, it was the best feeling getting away from everyone on the show. He said, “the hardest part was not being loved back…you’re not going to automatically be in a relationship because you’re the Bachelor.” The bloopers reel was next. Some things “The Bachelor: Women Tell All” missed – Elyse, who was the first woman to leave on her own, did not return. Thus, we did not get to hear about her experiences on the show or see how she’s doing now. Other women who also took the initiative to break-up with Colton first, Sydney and Heather, who were both in attendance on ‘The Women Tell All, were not asked to expand on their relationships (or lack of) with Colton. And, Colton being the first Bachelor to have the most women walk-out on him, this should have been explored just a little bit. 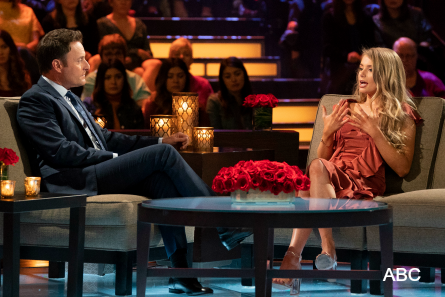 Another thing missed – Caelynn’s comments at her last Rose Ceremony before getting eliminated. She wasn’t asked about what she said in her reaction to Tayshia getting a rose, nor was she asked about telling Cassie to “get engaged.” She sort of addressed it briefly when she said her and Cassie wished each other to be the next Bachelorette. Still, it was a strange comment to make after supposedly getting her heart broken by Colton. One thing they did address that was forgotten about – the sloth. Producers had someone in the audience wearing the costume. They even made sure to invite the orginal sloth, Alex D., back. Harrison said the end of Colton’s journey “is unlike anything that we’ve ever seen on this show.” Sneak-peek footage of Colton talking to his Dad who is crying over Colton’s broken heart that Cassie caused. Then Colton has to pick-up the pieces he left behind with Tayshia and Hannah G who are both in love with him. At the end, we see Colton knocking on someone’s door. “The Bachelor” two-night finale finishes next Tuesday, March 12th at 8 EST pm on ABC Television Network.